100 Healthy Raw Snacks And Treats - Healthy snacks that taste great. Natural - Sugar Free - No Cook - Living Nutrition for Living Bodies. Fast Food doesn't have to mean Junk Food. And I'm NOT talking about rice cakes! I'm no different than you. When I get hungry I reach for the closest thing to put in my mouth. But after years of mistreating my body, and ruining my figure, I got smart. Now you can get smart too. Between my life and my career, I'm constantly on the go. And although I always knew I should be eating healthy, it was just far too easy to drive up to the clown's mouth and order a bag full of fat and a side of mega calories. But one day I looked in the mirror and I wasn't happy at who was looking back at me. At first I panicked. I'm smart enough to know that the secret to weight control is having an active lifestyle and consuming less calories than you burn. Well, I certainly was active, but the calorie part of the equation was working against me. Determined to get those pounds off that I had gained, I started packing celery, carrots and rice cakes for my lunch every day. Let me tell you, it wasn't too long before I was sneaking back to the drive-thru to get my french fry fix. One day I was crying on a co-worker's shoulder about how I was starting to feel like a rabbit instead of a woman, when she said "Relax, have some White Chocolate Gogi Fudge." "Yeah, right," I said. "You're some friend tempting me with junk food." "Honey, this is low calorie food. I'm not kidding." I took a bite and, like the leading lady in a 1930's film, I almost swooned. That was some fine-tasting fudge. I'll tell you that. If there was a recipe for healthy, low calorie fudge that tasted this good, what else was out there that I was missing? I became a woman on a mission. I started tapping into my fitness network and, believe it or not, I discovered that there were plenty of good-tasting, low calorie, sugar and chemical-free 100% healthy recipes for things I would have never imagined. My name is Carolyn Hansen. I'm a former National Champion Bodybuilder, a health and fitness author, and a co-owner of two health clubs in New Zealand. I rub shoulders with people who live, breathe and eat fitness. Sadly, despite my background, I was often tempted to eat things that I knew I shouldn't. You probably are too, right? And remember -- I'm NOT talking about rabbit food here! 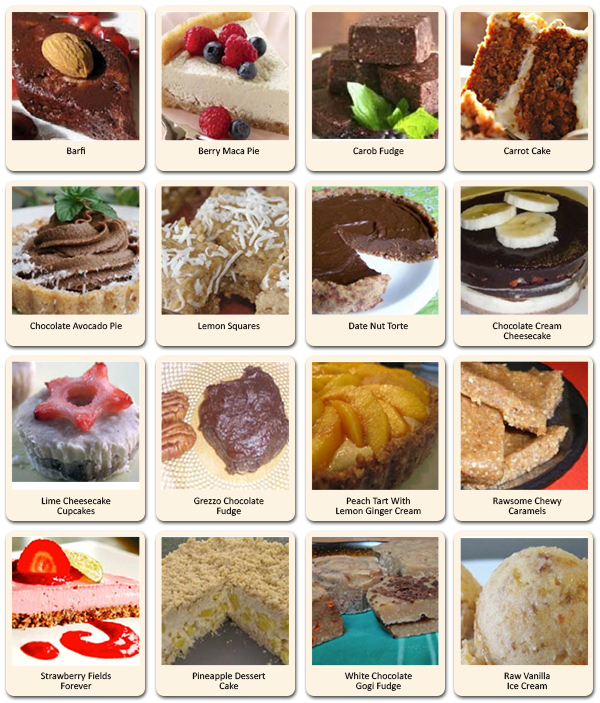 Each of the 100 recipes in my book at guaranteed mouth-watering. Plus there are no chemicals and no added sugar. What's more, these treats are so easy to make that even your children can whip some up for their school lunch every day! If you want to start eating healthier, and have your taste buds thank you for doing it, you really need to do the right thing for yourself and download a copy of 100 Healthy Raw Snacks and Treats right now. And even though I know that you are going to absolutely salivate when you start eating my 100 healthy snacks, maybe you're still not convinced. That's why I'm going to remove ALL of the risk so you'll have no problem making up your mind! Then, if this book isn't everything that I say it is; if it isn't everything that you HOPE it is, just let me know anytime within 56 FULL DAYS and I'll give you your money back. That's how convinced I am that this is the most amazing healthy snack food recipe book you have ever seen! That's right. You can download 100 Healthy Raw Snacks and Treats right now for just $27 and take a FULL 8 WEEKS (56 DAYS) to read it from cover to cover. Then, if you decide that 100 Healthy Raw Snacks and Treats isn't everything I say it is; if it isn't everything you HOPE it is, simply tell me any time within 8 FULL WEEKS and you'll get your money back. We'll part as friends. It doesn't get any better than this. You have nothing to lose! HERE'S YOUR OPPORTUNITY TO START EATING HEALTHIER WITHOUT YOUR BODY (OR YOUR FAMILY) BEING THE WISER! I realize you're willing to back up your claim that this book will make me salivate when I start eating those 100 healthy snacks by offering me a FULL 8-WEEK NO-QUESTIONS-ASKED -- ABSOLUTELY NO-RISK MONEY BACK GUARANTEE. Now is the time to take advantage of this valuable no risk offer and start feeding healthy and delicious snacks to yourself and your family. So if you really are serious about eating healthy, and having your taste buds thank you for it, you MUST download 100 Healthy Raw Snacks and Treats RIGHT NOW. Do the right thing for yourself and your family by downloading your copy of 100 Healthy Raw Snacks and Treats right now. Your taste buds never had it so good.